Everyone - well, most people... Enjoy cake. As well as this, a lot of people like chocolate cake. So if you've got a birthday coming up or want a sweet alternative to buying a gift, why not make some thing like this! ♥2x tub of chocolate butter icing, or butter, chocolate + icing sugar to make your own! ♥Preheat your oven! Gas mark 4 should do it! ♥Grease your cake tin, just get it done and out of the way! ♥In a bowl, cream together sugar & butter with a wooden spoon, it won't take long. ♥Sieve the flour & cocoa into the mixture, throw in your pink of salt! ♥In separate bowl, beat your eggs. Then add them to the mixture bit by bit, stirring the whole mix as you go along. ♥Melt that small sweet bar of chocolate either on the hob/in a microwave. ♥Add that melted chocolate to your cake mix! This isn't a necessity but it just makes it a bit more gooey and chocolatey! Only use a small bar or else your cake may not cook and you could end up with a runny mess! ♥Pour your mix into cake tin of choice, I used 2 shallow-ish ones, you could use 1 large 1. ♥Bake for 20-25 minutes. When you think you're done baking, stick a knife in the middle, if it comes out clean - you're good to go. Once cool, its time to beautify! ♥To make your butter icing, click here, I used a pre-made tub this time but the choice is yours and depends on how much time you have. ♥Spread icing over whole cake! If you've made 2 cakes, use as a filling/glue to stick them one on top of the other before covering. ♥Break each Kit Kat into single strips and place round the cake edge, one by one. The icing will work as glue to keep them up right! Note: you may need more then 2 packs if you've used a really large cake tin! 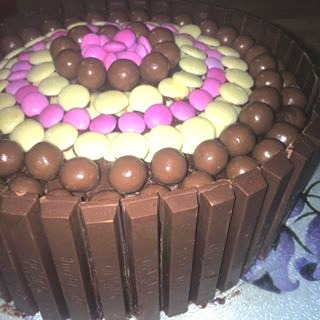 ♥Simply create 2 layers of Maltesers around the edge of the cake, your Kit Kats act as a wall to stop any escapee's disappearing. ♥Repeat above step alternating your Smarties & buttons. ♥When you reach the middle the choice is yours! You could have a mountain of Smarties or a bunch of Maltesers! Get creative! ♥Place in fridge for 20 mins to set the icing - don't worry, your cake wont dry out! Its got extra moisture from that melted chocolate! Serve up a big slice for all your friends and indulge! What are your go to chocolate bakes? Would you like to see more baking posts? 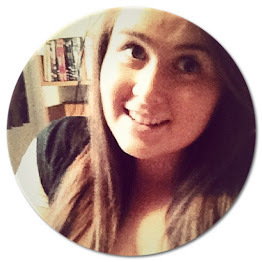 If you liked this post, like, share and follow me on Bloglovin'- that way you'll never miss out! Remember to follow me on Instagram and Twitter for more!